"You seem like a strong opponent...lets fight and prove who is stronger!" Apperance: Kira wears a blue undershirt with a white overcoats over it. Long black pants along with various medals decorating his clothing. He also as teal iris surrounded by pure black. Also has short white and black hair. Superior strength- His strength is dangerous to the point where even gods could even be killed by his hands if they were not careful. Strong Resilance- He can take a beating and keep on going. Demonic Blood- Kira can tap into his demonic blood to gain even more unnatural strength and abilities. He also grows a white and black horns on his head. Personality: Kira is a condescending man who refused to serve a god during the age of the gods. He seeks to fight strong opponents to prove he is stronger weather it be gods or the disciples that serve them. Background: A man of mysterious Origins, with the blood of a demon inside him he was treated differently bu his fellow peers who he could care less for. 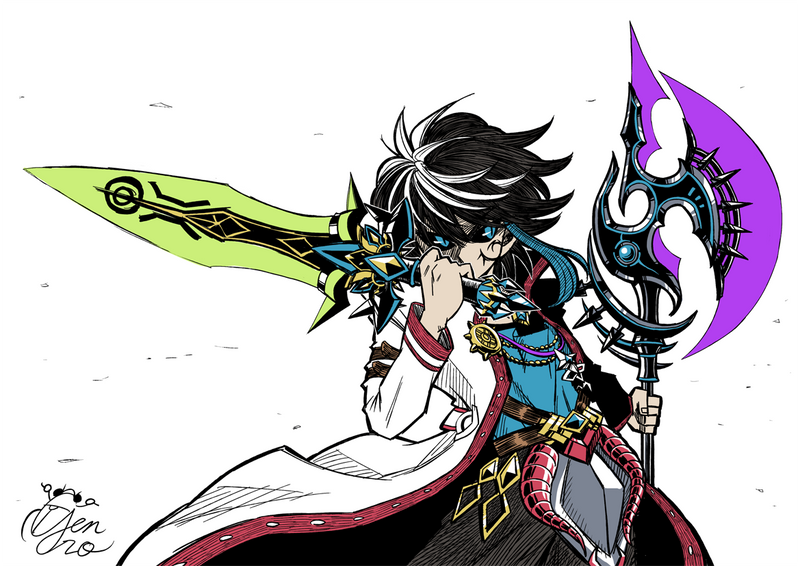 Before the war with the gods began, he would try to fight a divine being known as Karna Masta only to be sealed away after being thoroughly beaten. Eventually he would be freed many years later after the war of the gods were over. It became apparent to the Chosen Few, as horns grew on Kira's skull, that the interloper was not a normal mortal. They were more familiar with demons associated with one side of the coin, i.e, Chaos. They never heard of entities embodying both sides at once. The arena had become more active around the brawl. Several buildings destroyed, a crowd of bizarre bystanders had surrounded the fight. Before they arrived, they were aware of explosions in Armourer's Place, noises that could only be placed on the result of a few weapons, gunpowder and nuclear, being disturbed. The crowd tried to edge away from the areas of fallout and still get a good viewing point at the same time. A few of the shopkeepers, covered in soot and radiation, made up a small percentage of the audience, yelling at whoever costed them an arm and a leg, and more appendages on that note. Of course, they were just outside the area where the fabric of Fantasy was currently being put through the wringer. The fabric of Fantasy is rather loose, as is apparent in worlds like the mobile Discworld, and the mana-infused Equestria. Dimensional distortions occur on a regularly basis. In some places, fungus vivere, or mushroom men, are often spotted bapping each other to the death, fighting over chunks of necrotic debris, sourcing from the Necrostar in the Vice Quadrant. To sum it up, the Chosen Few are, currently, considering ending the fight before demons from the Dungeon Dimensions begin to crawl, or whatever mode of movement they use, into the Imagiverse Centre. Adam Skelecoot tried to prevent himself from seeing formless horrors in his peripheral vision. Preparing to prevent the Centre becoming a hub for demonic portalling, Adam unsheathed his magic sword, labelled Hope in ancient runes, from the back of his ribcage. Max set his robot arm to Cannon mode, which involved the arm expanding at the upper arm area, a circular hole opening up at his palms. Jack, well, rummaged into his backpack for something useful against dual demons. "I will not lose! I am and will be the strongest being!" Kira yelled as he clashed with Laadan. However when he saw that two more people had arrived he knew he was outnumbered, however he still had his ultimate attack. But if he used such a thing this town would indeed suffer for it, but of course there was the threat of excess energy tearing a portal and allowing a demon to enter from it. He decided it was best to fall back home, there was a high chance that one of them could avoid his attack. And there was a greater chance that people from Grand Gaia would arrive to assist in subduing him. At least he can leave with the thought of three people needing to stop him. "Adversus!" He called out as he leapt back from the clash and using his sword cut the ground in front of him causing it to split and create a massive gap. This was not now the move is usually used however he needed to pull back. No point is losing here, it would all be for nothing. With that Kira would rush to the portal he had entered from. Laadan seized up in mid attack, her ablaze eyes wide in disbelief, now just big round circles of green light. She was speechless. It was so abrupt that she had nothing to say or any idea on how to react... on top of it all, she was cartoonishly frozen in place. With Kira's departure it would be moments until she finally stood straight again, towering over most of the residents that had gathered, her antennae falling limp and dangling at the sides of her head. "Laadan... w-won," she says, puzzled, lacking the confidence she once held, rage drained in an instant, tilting her head to the side like a confused lost puppy. She lowers her head, folding both sets of arms in thought then raising back up and straightening up, eyes beaming once more. "Yeah... YEAH! Run away, axe man! Laadan is strongest there is, strongest there will be! LAADAN ... ..."
With this she finally looks around at the destruction that their fight has wrought upon the centre, curling her cloak around her body and sinking her head down. Unlike Zilthai who has more nihilistic when it came to emotions, as an Id Laadan was an unfiltered giant ball of it, and right now she felt bad. She even began to literally shrink down in size losing a portion of mass she gained, some of the things she consumed returned to their original state starting with the street light she ate at the beginning of the fight. Just a few miles away, a portal opened up in the world. Another portal opened up and from it came the figure of a man with white hair and holding an axe and sword. Kira, from Grand Gaia had appeared. He examined the new and...rather strange land. Blocks...blocks...blocks...Blocks! As far as the eye can see. The trees were made of blocks, even mountains that appeared to defy gravity stood up straight. However this was not his concern, he was looking for a strong fighter. However he was not sure anyone in this land could be strong fighters, like like that city centre he was at. He soon began to look around for any sign of life.